Find the location of the secret Battle Star & hidden free Battle Pass Tier from the Season 5 Week 3 Fortnite Battle Royale Road Trip Challenge! Players who complete the weekly challenge for 3 weeks will be awarded with a loading screen which contains a hint to the hidden Battle Star location. SPOILER ALERT! Critical hint below! 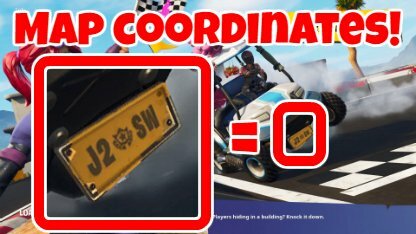 The license plate of the ATK says J2*SW which means J2 square of the map, South West. The secret Battle Star's can be found North East of Wailing Woods. The coordinates narrow down the location to section J2 of the map and further specifies that the Star is located in the South West of that section which is just a tiny piece of land. Note: You can complete challenges from any 3 different weeks to unlock the secret Battle Star location. You don't have to accomplish weekly challenges in chronological order. At the South West corner of the J2 section, there is a wooden house close to the edge of the map. Aim for the bald patch of ground in front of the house. While skydiving, use the wooden house as your guide then find the bald patch of soil once the texture has rendered. The Star will appear on the bare patch of ground in front of the house.